New CareChex Study Assesses Quality of University Hospital Care in the U.S.
CareChex, a division of The Delta Group specializing in rating the quality of hospital and physician care, released a new study, An Assessment of the Quality of University Hospital Care in the U.S., that investigates whether or not university hospitals outperform other hospitals on objective measures of quality. A landmark study of 22 million safety devices used in 61 French hospitals over a two-year period has confirmed the theory that passive, fully automatic safety devices offer significantly better protection against accidental needlestick injuries (NSIs) than early generation active safety technologies such as semi-automatic (push-button) devices or those with manually sliding shields or hinged caps. In a major paper published in the journal Anesthesiology, a Cleveland Clinic-led research team announced the development of a new publicly available tool to help patients, regulators, and hospitals compare patient outcomes and quality. Adventist Health System, the largest not-for-profit Protestant healthcare provider in the nation, has partnered with Language Line Services to offer its 43 hospitals and numerous clinics access to a comprehensive suite of interpreting and translation services in an effort to better serve its limited English proficient patients and families. 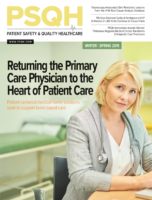 Nurses’ roles, responsibilities, and education should change significantly to meet the increased demand for care that will be created by health care reform and to advance improvements in America’s increasingly complex health system, says a new report from the Institute of Medicine. Without a doubt, 2010 has proven to be one of the most dynamic years that the healthcare field has seen to date—and more changes are just around the corner. Healthcare reform is shaking up the field, impacting everyone from doctors and patients to hospitals, healthcare facilities, and medical technology vendors. As our global population grows older with a higher incidence of chronic conditions, we have an imperative to truly improve quality of care both within and beyond the walls of the hospital while reducing costs. From the signing of healthcare reform legislation to the release of final rules for “meaningful use,” events in 2010 are driving toward a true transformation in the delivery of healthcare in the United States. Accreditation Canada’s 2010 national report on health care in Canada explores the connection between quality of worklife and patient safety in health organizations. Recent research shows a significant correlation between the frequency of adverse events and malpractice claims (Greenberg, et al, 2010). Meanwhile, information from patient satisfaction surveys and patient experiences of care have been shown to predict malpractice risk (Fullam, et al, 2009).